Chris Kontos is an american drummer born in New York City. 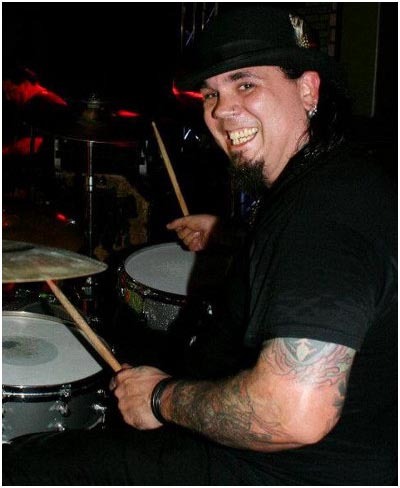 He is a former drummer of Machine Head and joined the band in the fall of 1992. Machine Head attended the L.A. Metal Fest at Gazzari's in Hollywood with Tony on drums. Chris was the light technician and it would be Tony's last show as Chris effectively talked his way into the band, much to Tony's dismay. His first show as the Machine Head drummer was on November 21, 1992 at a place called Mayday Malone's in Pleasant Hill, CA. In 1995 the band would return to Europe for the summer festival season but Kontos refused to tour and the band drafted Walter Ryan for the festival dates. On the band's return to the US, Kontos was fired because he was not keeping to touring commitments. Kontos was replaced by Dave McClain. He played in many bands and projects before and after that period of time, including Testament, Konkhra, Attitude Adjustment, Exodus, Death Angel, and Verbal Abuse.